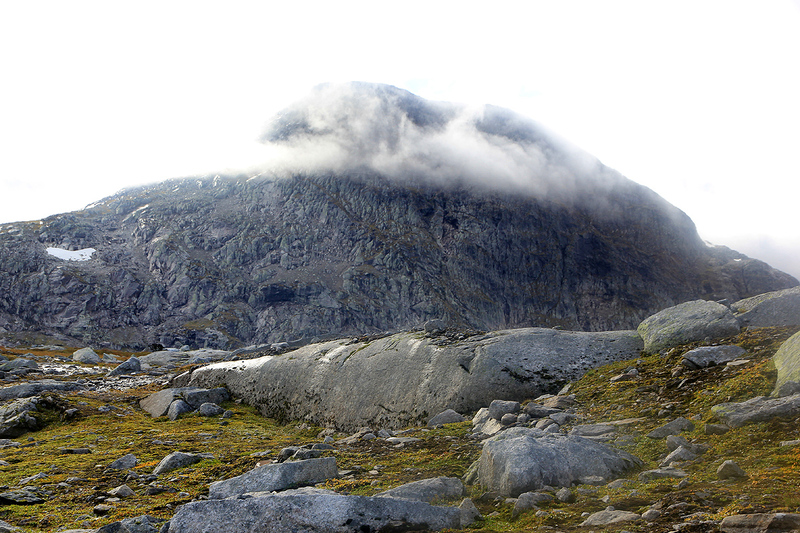 Kvigtinden is the highest peak in Børgefjell National Park, almost 1500 square kilometer of wilderness located mainly in the southern part of Nordland. With access from the south, the most practical airport is Værnes, serving the city of Trondheim. From this airport, the drive to the trailhead is approximately 300 kilometer. Drive north on Hwy. E-6 until you enter Northern Norway, that is Nordland Fylke. This crossing is hard to miss as there is a specially designed portal across the road with welcome signs etc. Measure your distance driven from here. After 7.7 kilometer, you drive by the railroad station Majavatn on your left side. At 13.5 kilometer, you should turn off E-6 to the right. There is a sign along E-6 at this point saying 190 kilometer (south) to the city of Steinkjer, and 82 kilometer (north) to the village Mosjøen. Continue on this paved, but more narrow road to kilometer 26.1, where you turn right. Then at 28.4, you turn right onto a smaller road signed with "Børgefjellet 3." Continue to kilometer 31.1, where you find parking on the right side as well as several signs with information about the national park. 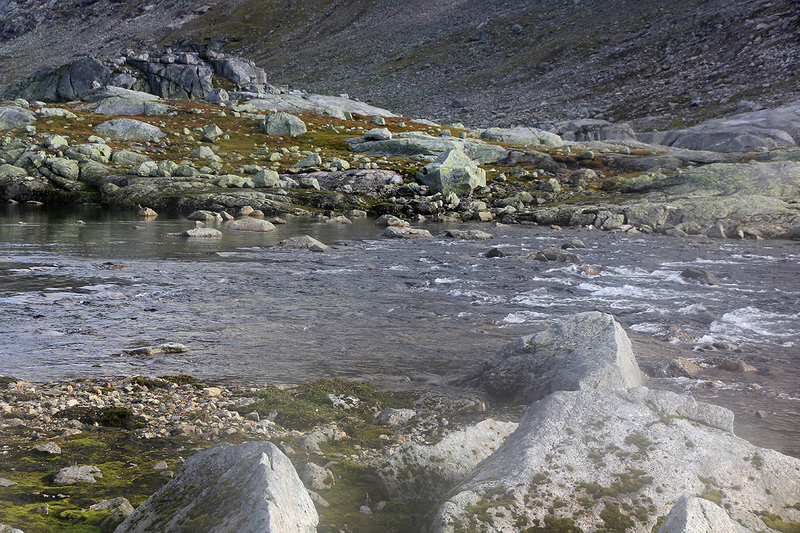 The location is called Simskardet, this is the trailhead, location N65:17.697 E013:35.924, elevation about 408 meter. 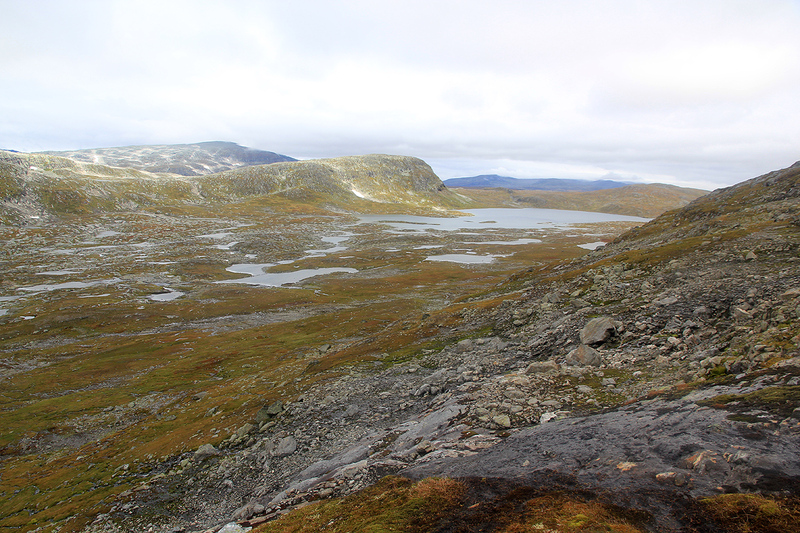 As you near the end of this valley, elevation about 720 meter, ascend gently to your left in order to reach the west side of the lake Vestre Måsskardvatnet (881m). Here, one needs to cross the river. This river runs down the slope you just ascended and could be dangerous to cross near the rapids. A bit further east (closer to the lake), there is another good place to cross. This river can be quite big and care is needed when you ford. Continue west on the south side of the lake until you cross a creek that comes down (cascading) the steep slope on your right hand (south) side. Ascend the slope (grass) on the left side of this creek (going south), until you reach the entrance to the small upper valley (about 1150m) between Måsskardfjellet (1536m) and Kvigtinden. 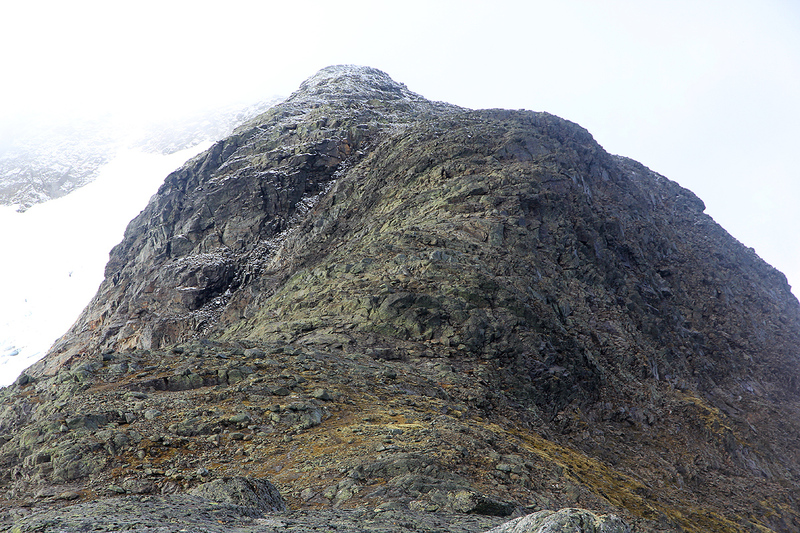 Turn more left (south-east) and ascend the (north-east) ridge of Kvigtinden. 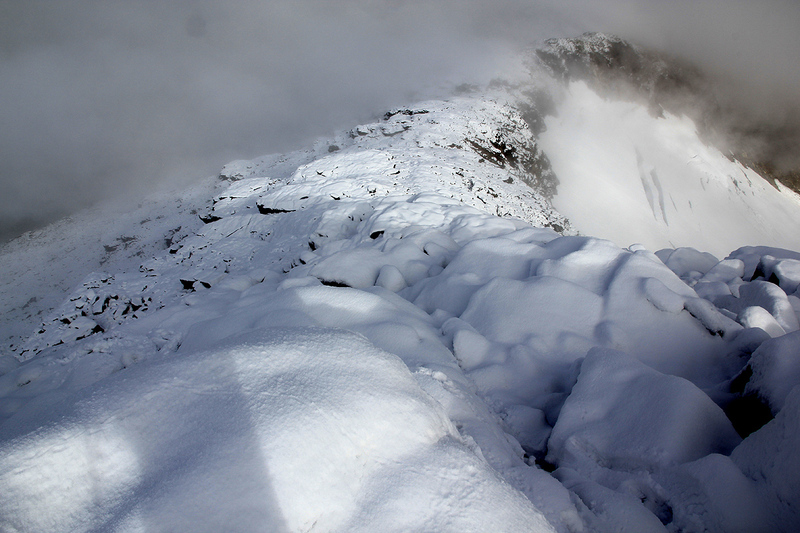 The terrain is easier if you stay a bit more left, hitting the ridge (about 1350m) near a (small) local hump. Turn right and follow the ridge to the summit. There is a slightly steeper section quite early that is best to ascend on the left side. 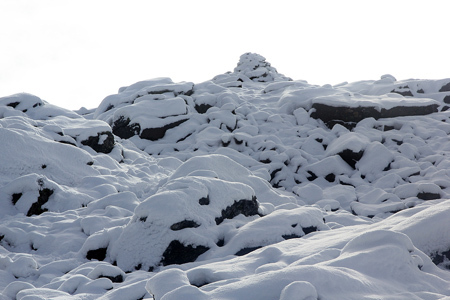 Just before the summit, there is a second steeper section which can be scrambled starting slightly right, then moving directly up on the center part of the ridge. 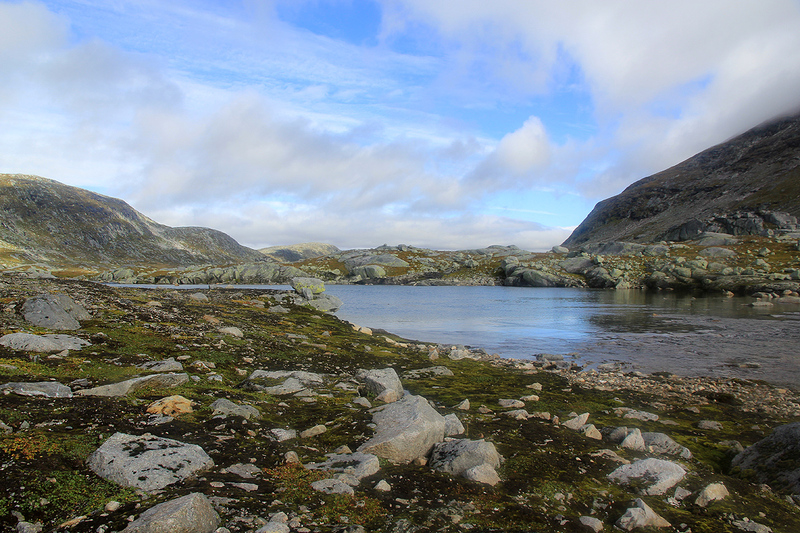 I arrived at the trailhead the night before after a 300 km drive from Trondheim airport. It had been raining all evening and I decided to sleep in the car if at all possible. This turned out to work well and I woke up at 0500 for breakfast and trip preparations. The rain was still coming down quite intensely. I left at 0600 and quickly ran into minor problems. Several small creeks crossed the trail, and they where now all quite flooded from the sustained and heavy rainfall. Too wide to jump (easily) and too deep to step into without getting soaked. My thoughts went to the more serious river that I knew I needed to ford much further along. 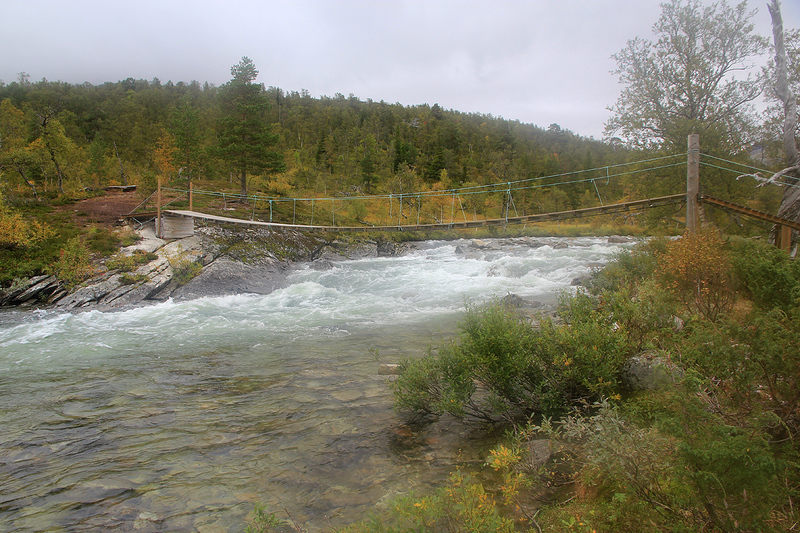 I found the bridge crossing Golverskardelva (river), then continued (without any trails) towards Bisseggskardet. Gradually, I got more and more wet, from outside and inside, the rain did not seem to stop. I carried a spare pair of running shoes for the river crossing as I wanted my mountain boots to stay (sort of) dry. The river was likely running quite a bit higher than normal, water to my knees when stepping on the big rocks. 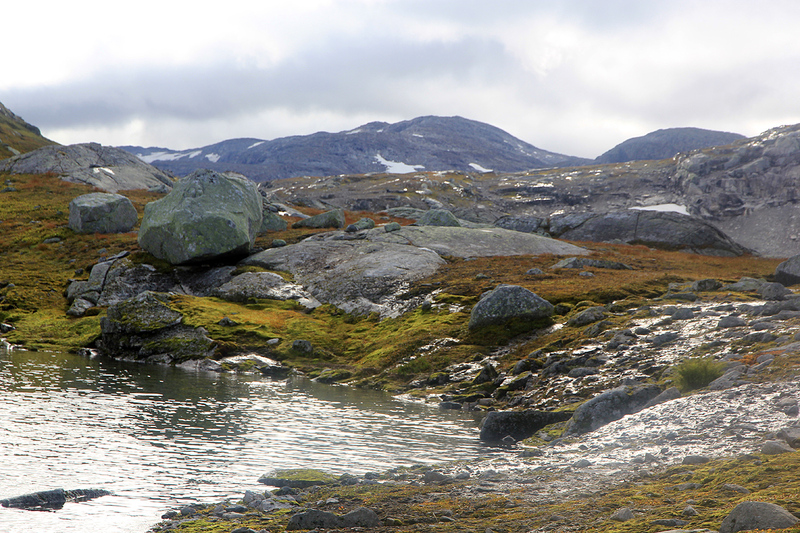 These rocks were slippery, but I avoided stepping between them, this would have implied water almost to hip level. As I crossed the river, the clouds lifted a bit and the rain stopped. Good news! I put my jacket on the backback to dry and continued with my fleece as the outer layer. 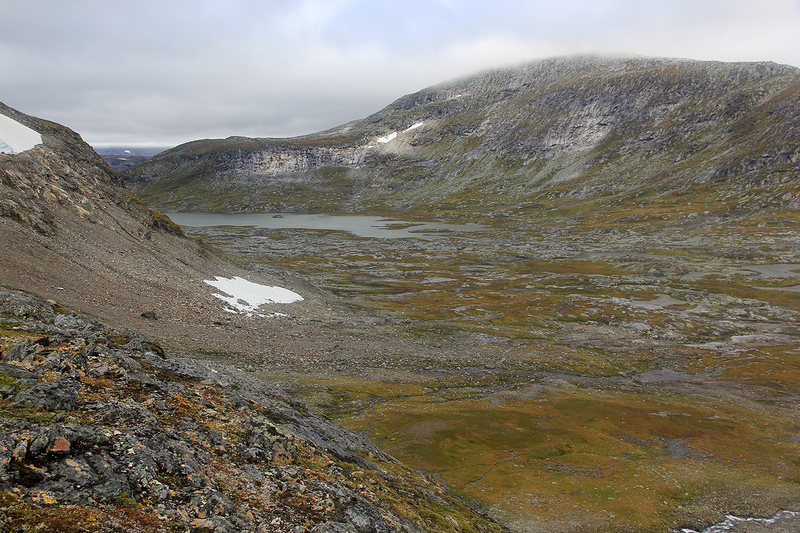 Børgefjell is a true wilderness area. Mountains and lakes, valleys and some really huge rivers, the landscape is impressive and shows large scale dimensions. Nobody in this huge park but me. 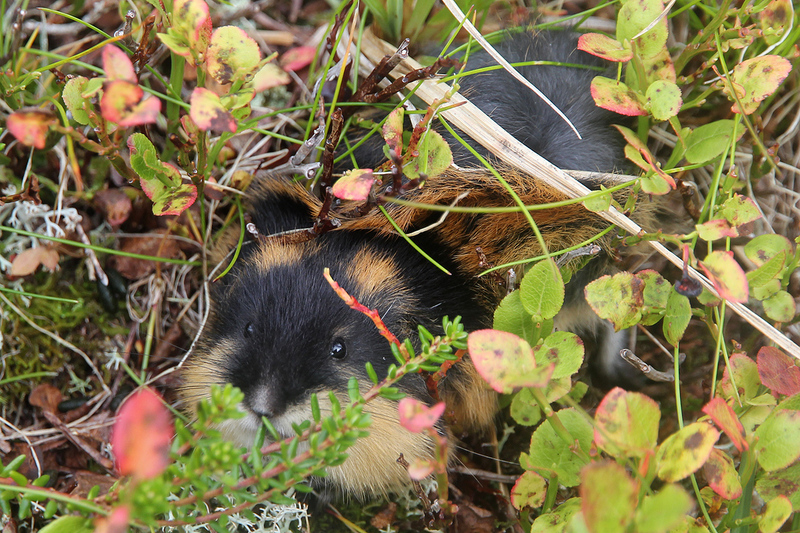 Actually, I was never alone as the mountain was overcrowded by lemmings. This small animal with a most aggressive behavior, could be seen everywhere. I cannot recall to have seen such a density in the last 30 years. The fall season was already entering its final act at the higher elevations. 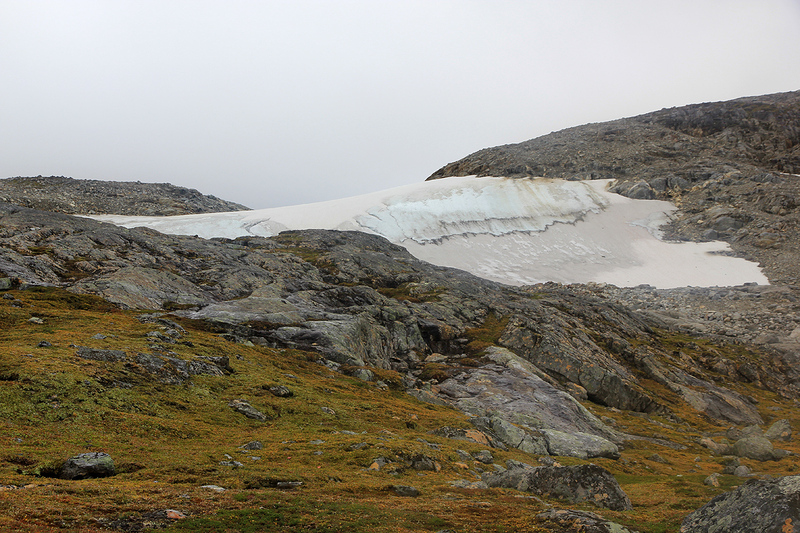 In fact, a nice aspect of this hike was starting among trees at 400 meter of elevation, then hike through several zones before ending with winter at the very summit. The variation in color that one sees in the mountains at this time of year is very special. Winter is next and nature is busy with final preparations. I continued along the lake and managed to cross the last creek without getting wet. The ascent was easy and I finally arrived at the summit ridge. 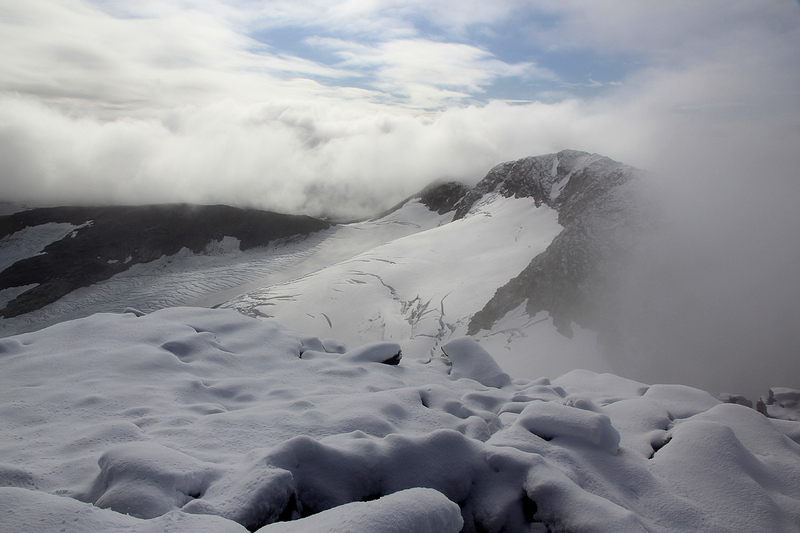 The top itself was well hidden in a cloud, but I got a glimpse of the glacier on my left hand side. Some easy scramble and I ran into new snow. More the higher I went and this called for more caution. 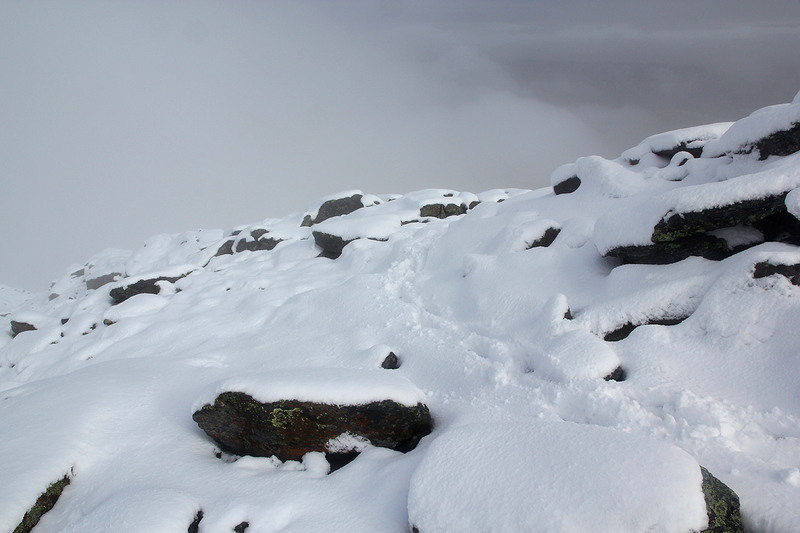 The snow effectively was hiding suitable steps for boots and suitable places to grab for hand support. Slippery. I left my walking poles behind, needing to touch the rock with my hands. 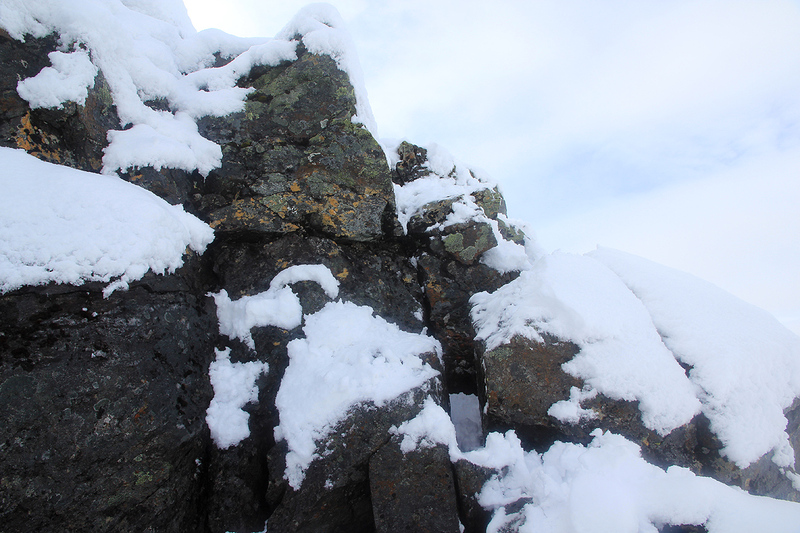 Higher up, I came to a more steepish section that I climbed head on, clearly the crux of my route. With dry summer rock this would have been (YDS) class 2+, now it was clearly in the class 3 range. (There may have been a slightly easier route further right.) 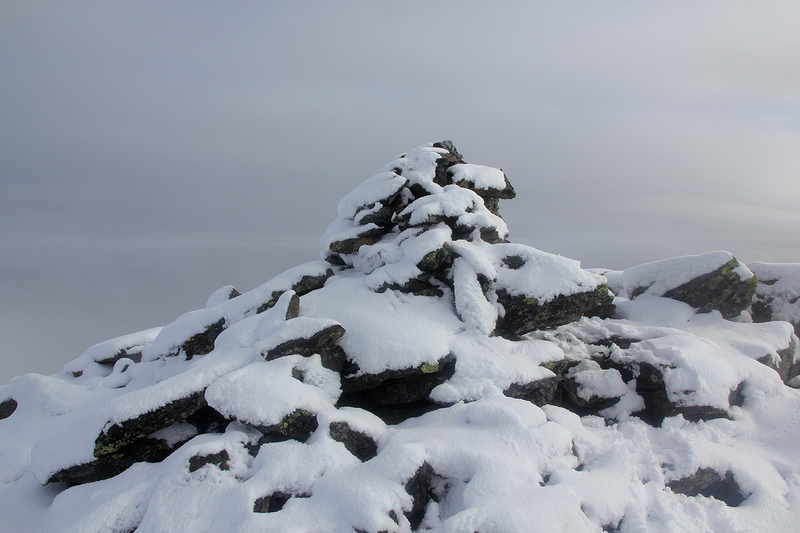 Once on top of this section, I could see the cairn, the final 20-30 meter being nice and gentle. I arrived at the summit by 1145, 5:45 in extremely wet conditions. 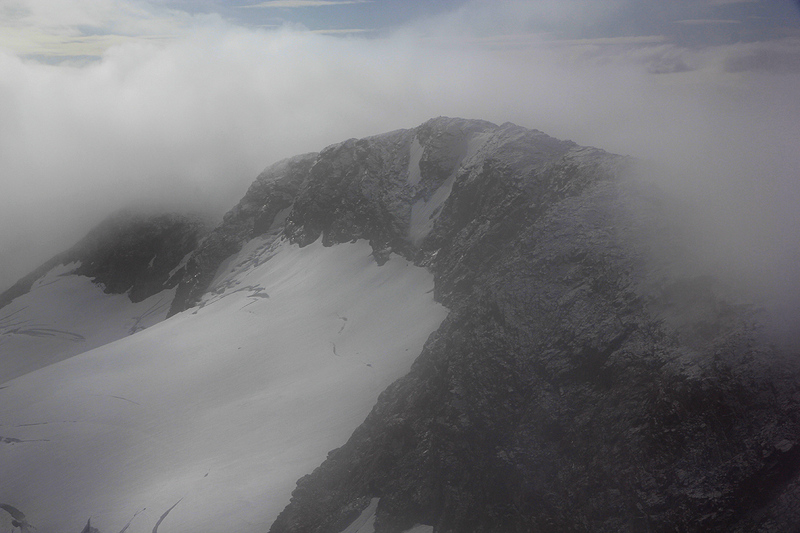 The sun was visible between clouds and I got an impression of the ridge that continues south with a fairly substantial glacier on its eastern side. 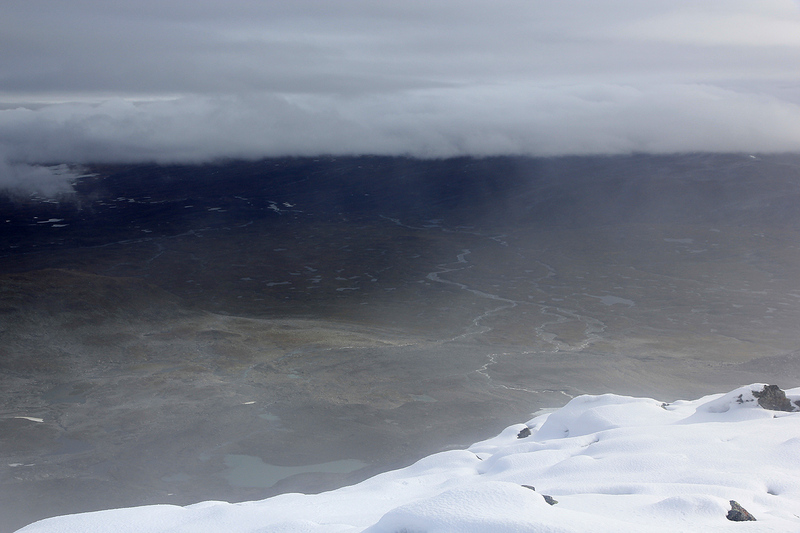 A couple of breaks in the clouds and I could see some of the landscape further below. I left by 1200 and had a pretty good (and much drier) hike back to the car, arriving there by 1700. 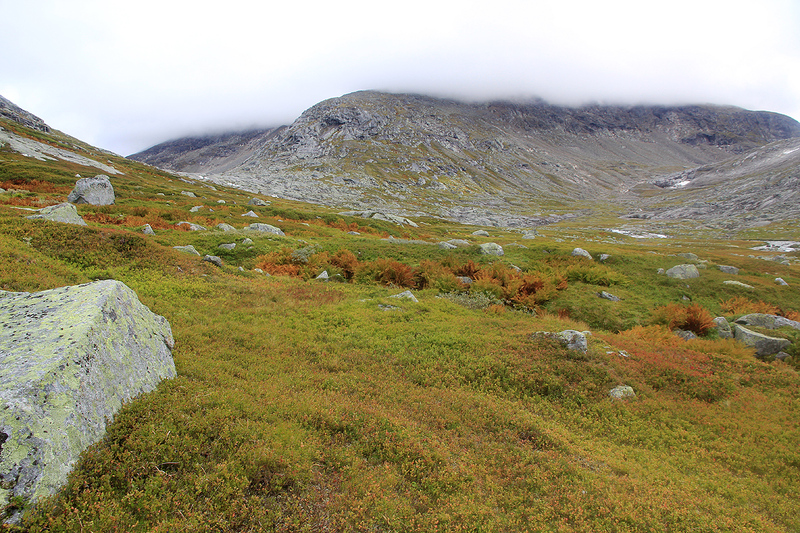 This was my first hike in Børgefjell, it left many good memories despite the somewhat nasty weather. I continued my trip by driving south and found a nice place to camp near the base of Heimdalhaugen (1159m), the highest mountain in Grong. Looking back to Vestre Måsskardvatnet. 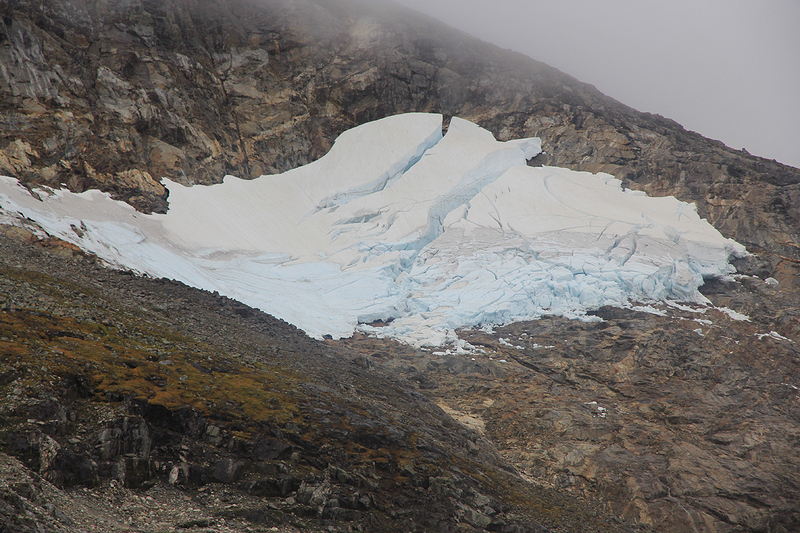 A mini-glacier about to disappear.